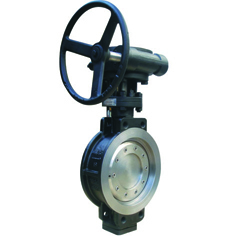 Metal seal butterfly valve(MSBFV) have two types: Multi-layers and Metal to metal seal, whatever, Pressure is less than 600Lb, seal ring is in disc; pressure is equal or more than 600Lb or medium flow rating is higher, seal ring will be in body, can avoid medium flushed. Stem is connected with disc in two types: Pin connection, Pin & Key connection. Normally, it is Pin connection. When pipeline working in high vibration condition, we use Pin & Key connection. Stem end will be fixed by Bi-Section ring or Special adjust end structure as per working condition. 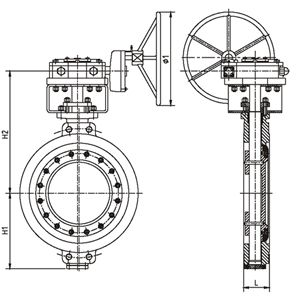 We provide several stem packing structure: Spring loaded type, Burgmann packing etc. Multi-layers seal ring is include multi-layers and soft material, when pipeline temperature is up and down so fast, material extend rating will effect valve function, like leakage or stick with body, if there is situation in working condition, please let our engineer know it before you purchase order. Our engineer can provide best solution to avoid this situation. When working temperature is more than 300℃, please discuss with us, our engineer will provide advice best solution. All dimension is in our catalouge. Catalouge download: http://www.cnvtrade.com/_d276407776.htm contact us for download password.